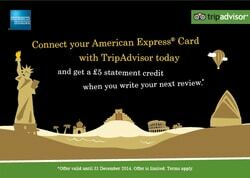 American Express and TripAdvisor are offering £5 credit statement for your next review. Once you have connected your card and your hotel review is published you will receive the credit statement on your account. They say it posts after the offer is over however me previous statements took considerable less time. This is limited to the first 15,000 posted reviews and offer is valid until 31st Dec 2014. Previously me and my husband both received the £5 credit statement with our Amex and supplementary cards, so this might work this time around too. Get a £5 statement credit when you connect your American Express Card and your next review is posted on TripAdvisor. Limited to the first 15,000 posted reviews. Offer valid until 31 December 2014. You must connect your eligible American Express Card with TripAdvisor to be eligible to receive the £5 statement credit. Offer limited to the first 15,000 posted reviews. Only one £5 statement credit per connected Card. Statement credit may not be received if a review doesn’t meet TripAdvisor’s qualifications and is not posted by TripAdvisor. Corporate and prepaid Cards are not eligible.